Now that I’ve blocked off the time to sit down and write about Command & Conquer, I’ve come to the conclusion that it’s difficult to avoid the temptation to just devolve the whole thing into a slew of unit quotes and game quotes. After all, probably 80% of what I remember from the original C&C are the voice clips. So no more voice clips. No. I picked up the C&C Ultimate Collection from the Amazon sale (which is still ongoing at the time of this writing), and after all the negative press about “lazy EA” and “lousy porting”, I find myself pleasantly surprised. C&C 95 ran without a hitch. Then again, I haven’t yet tried any other games in the set besides C&C 95 and Generals, and if the latter didn’t run, we really would have had a big problem. Command & Conquer is of course one of the great granddaddies of the real-time strategy genre -- the game that epitomized the much-maligned concepts of SimBase (build up a huge base and never attack!) and the tank rush. I can’t delve too much into the intricacies of the system and how unbalanced it may be, but I can say that the unit variety isn’t that inspired, and different types of infantry don’t even get distinct voice clips. They all sound like the same freaking soldier dude. Even the setting didn’t do much to wow me when I first saw it in action long ago. I had played Westwood’s Dune 2 -- the game widely accepted as the first modern real-time strategy game -- and while C&C definitely had superior graphics and presentation, the world was kind of flat. Dune 2 had all that rich background and had detailed build screens for the structures and a unique gameplay element in carefully traversing open desert. Command & Conquer, in comparison, looked like a generic modern military game with maps that had no sand worms lurking under the surface. It even had only two factions compared to Dune 2’s three! It can’t be denied though that C&C is still tons of fun. I fired up a GDI campaign (a new experience for me -- I had always been a NOD-first player) and ran the game through its paces. Three missions in and I was hooked like it was 1995. C&C remains an enjoyable game because it’s designed to be a game that anyone can get into, not just the diehard RTS players. There’s a certain purity and enthusiasm to be found in C&C that I’d be hard-pressed to find in any RTS that came out in the last ten years. Competitive RTS gaming was non-existent before C&C was released, and back then, the game’s developers had no checklist of RTS tropes that they needed to hit to grab the attention of the gaming public. There were no standards for hotkeys, or controls, or presentation, or any of those things. C&C remains an enjoyable game because it’s designed to be a game that anyone can get into, not just the diehard RTS players. For someone like me, who largely avoided RTS titles during my childhood because I sucked at them, this is an amazing opportunity to get back into the genre and revisit old memories while relearning the concepts and strategies that the better players in the 90s already knew. With C&C, I don’t have to wrestle with any unit’s secondary or tertiary abilities because there are none. There’s no modelling of cover, no worrying about unit fatigue, no worrying about running out of ammo or fuel, or anything else that strategy games have introduced since then. C&C simply demands that I stay on top of my war economy so I can crank out enough units to take out the other guy. Sometimes I like it straightforward and simple like that. Command & Conquer of course grew into a huge franchise and spawned numerous sequels and alternate universes, and it certainly influenced many of the other RTS games we see today. I would argue, though, that most developers were far more influenced by the gargantuan gorilla of RTS gaming: Blizzard. There was once a time during my grade school days when you were either a Warcraft player or a C&C player, and lo, you would be judged according to your affiliation. It’s easy to see the Blizzard influence on modern RTSes: right click to attack and move (which C&C would later adapt), a unit selection group limit, and the funny quotes that your troops would say when you clicked on them repeatedly. There should be no doubt, then, that Command & Conquer has managed to keep its own identity for itself: great RTS gameplay that features lots of guns and explosions, goofy live action cutscenes, and lots and lots of imaginatively-designed tanks. I like to think that it’s an elegant formula -- one that’s not as easily copied. The Command & Conquer Ultimate Collection is available on Origin. But if you’re reading this in September 2013, don’t buy it there -- get it from the Amazon sale at 55% off! As mentioned in Episode 7 of the podcast, I’ve recently picked up (again) Heavy Rain, hoping that I’ll finish it this time around. For some strange reason on this 2nd playthrough, I’ve been constantly hit by warm fuzzy memories of Shenmue. Ah Shenmue, the game that introduced me to the whole Interactive Drama genre, where you actually “play” a movie, rather than a game. I know the statement makes no sense nowadays with most AAA titles being produced almost to a Hollywood-like quality, but back then, Shenmue was pretty ahead of its time. Shenmue was pretty ahead of its time. I personally didn’t own a Dreamcast when it came out. Fortunate for me though, I had a cousin who owned the console and agreed to lend me his Dreamcast while he spends his summer vacation in the States. The first question I asked after he handed the console to me was if he had a copy of Shenmue, since I’ve been really wanting to play this game after I saw a piece on X-Play featuring Shenmue. Unfortunately, he didn’t and I had to go buy it for myself. No matter: it was a small price to pay for admission, since I didn’t have to buy a new console just for one game. So after procuring a copy of Shenmue, I popped the CD in Dreamcast the moment I got home, and excitement started to rush in. I’ve read so much about Shenmue since it promised open world exploration, mundane jobs (forklift racing anyone?) and realistic behaving NPCs, where some of them would only appear at certain times of the day. Notably, Shenmue is famously known for being one of the most expensive games ever being developed, so you can say that I was all aboard the hype machine. Admittedly, I can only now remember bits and pieces of the game, besides doing all those Quick Time Events (QTEs), then transitioning to a fighting game-like system which was pretty well done and made sense in the game, since the story and characters are pretty much grounded in reality. What stood out the most to me is that you can actually step into an arcade and actually play the games! Of course being published and developed by SEGA, the arcade cabinets inside the game are all SEGA games, which wasn’t a bad thing really. You can play the classics like Space Harrier and Hang-on and I was amazed that it was playable and it’s the actual full game. Playing a game within a game (Yo dawg!) was definitely something unique and amazing for me at that time. After 3 straight days of playing, I eventually finished Shenmue. Unfortunately, the game didn’t have a proper ending, since it was supposed to be followed up by a sequel, which actually came out for the original Xbox years after which I never played. Nevertheless, the whole experience of playing through Shenmue was truly unique and left me wanting to play more of these games. Thankfully, Quantic Dream has been serving games of the Interactive Drama genre with Indigo Prophecy, Heavy Rain and the upcoming title (as of this writing): Beyond Two Souls. I’m glad that there is a developer still catering to this genre as I truly believe that an Interactive Drama delivers a truly unique way of storytelling. I’m also glad that I was able to experience Shenmue and as the saying goes, you never forget your first time (wink!). In 1989, even a Hershey’s bar drew ooohs and aaahs from kids like us who had yet to discover the meaning of the words “freedom” and “excess”. I bolted up from bed, instantly shaking off the sleep the way only a six-year-old could. My room was already bathed in morning sunlight. It was Christmas vacation, and I had overslept. In fact, I would have overslept for far longer if the voices hadn’t roused me -- familiar but seldom-heard voices that had drifted off from way over the other side of our house and through my bedroom door. I got to my feet and ran off excitedly. The arrival of my uncle and aunt from the States was always a cause for minor celebration. Stuff from overseas was not as easily obtainable back in 1989, and even a Hershey’s bar drew ooohs and aaahs from kids like us who had yet to discover the meaning of the words “freedom” and “excess”. I burst into the dining room with a gigantic grin on my face and chocolate bars in my brain. Christmas with exotic toys and sweet, sweet chocolate! And maybe Cowabunga! or whatever catchphrase was cool at the time. Then I skidded to a halt. An unfamiliar sight greeted me. Even as I tried to fight it, I felt my grin slowly but steadily melt away into an unfiltered display of flabbergast. A collection of white gleaming boxes lay on the dining table, almost traversing its entire length. Each had its own distinct shape, and each had different bits sticking out of it, but it was all very futuristic and out of place on our venerable wooden dining table -- very alien-looking in our dining room with the drapes and the nice landscapes hanging from the walls. “That--that’s a computer,” I said wide-eyed, my voice barely over a whisper. My uncle was standing before the keyboard, rapidly playing his fingers on the keys and enjoying the sharp click-clack that they made. It wasn’t on or even plugged in, but that moment would forever burn itself into my memory. Okay, so it wasn’t my first experience with a computer, and it certainly wasn’t the most powerful thing to hit the market by the time it found itself in our home. 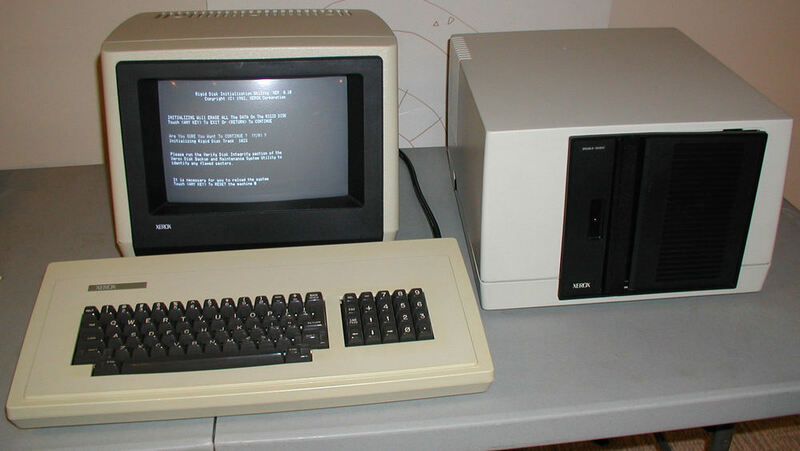 The giant mound of machinery in question was a Xerox 820-II, and at the time, it was already obsolete. It originally came out in 1982! I had no idea what the hell it was for. My cousin’s 286 could run Wordstar and Pool of Radiance, so what was the point of this thing? Although I didn’t understand it, I was awestruck all the same. This was The Future, right in our very own home. We finally had a computer! Not many pictures with that Xerox 820 survived, but here is a picture of me having a staring match with the machine’s monitor, which certainly earns the accolade of being tiny and ginormous at the same time. See that thing on the lower left? The black bits on the front were the floppy disk drives. The disks it accepted were 8” floppy disks. Eight inches. See, there’s a reason why they called those 5 ¼” floppy disks mini floppy disks! Each 8” floppy held less than 500k of data. Where was the processor, you ask? It was in the monitor. So games weren’t terribly exciting on this thing. That’s ok. That’s fine. We never had games on it. We had lots of business software for the thing, sure, and they came in huge cardboard boxes full of those 8-inch floppies. Heavy cardboard. With pastel stripes printed on the labels that just screamed HIGH TECH. Pastel stripes. With curves. Against a black background. Then there was the printer. I considered the printer to be the most sci-fi of the lot. The Xerox 820’s printer used a technology called daisy wheel printing, which is basically a fancy 70s-sounding term for a really cool piece of tech -- a metal wheel with many, many tiny spokes that each resembled a typewriter’s type bar. I suppose the wheel spun around to the appropriate letter and hit the ribbon on the paper much like how a typewriter would have done it. It was really, really cool. This meant that the printer was limited to whatever glyphs were available on the daisy wheel, but also that the output was basically as sharp as any typewriter or movable type press could produce: the text was crystal clear. And! And this next bit blew my mind. The goddamn printer came with multiple daisy wheels. We had three. It was like having three typewriters! Or three fonts! I think we had a serif, a sans-serif, and a really ugly italic font. I really liked that italic font. The goddamn printer came with multiple daisy wheels. It was like having three typewriters! Or three fonts! You can bet that I got really acquainted with that italic font, too. When my mom wasn’t writing her documents in the computer’s word processor, I was busy fiddling with my favorite program for the Xerox -- the graph maker. I used to make bar graphs and line graphs and pie graphs like nobody’s business. I can’t even remember what kind of “data” I plugged into those fields, but I lost hours and hours fiddling with the graph maker. That was my entertainment with the Xerox 820. You know what? I never lost my love of making graphs and charting data, either. I miss the damn thing. I miss our Xerox 820. I can’t claim to have had strange dreams about it, but on occasion, while buying new parts or hardware or gadgets, my memory flashes back to that image of my uncle fiddling with the keys on the thing’s gigantic keyboard. Me skidding to a halt. Me, processing the fact that our house was about to become One of Those Houses that had a computer in them. Me, trying to contain my inexplicable excitement towards the pile of obsolete tech on our dining table. I was a Nintendo Power kid. I’ve always been. Long before I discovered the internet, or EGM, or Gamepro, or any of those other venerable institutions of game-related content and commentary, I was already coveting whatever issue of Nintendo Power I saw that I didn’t own yet. I never actually owned a lot of them, since my mom kept me on a very short leash when it came to dropping money on frivolous things. The four or five I did manage to “amass” over the years got read from cover to cover so much that the ink looked like it was fading from the intensity of my constant gazing. All I knew about games beyond my Famicom outings, I knew from Nintendo Power. It defined the realities and the boundaries of my gaming world. And then -- just out of curiosity, really! -- I happened to pick up an issue of Dragon Magazine from a Nova Fontana branch that no longer exists today. Ral Partha miniature ads featuring unsettling monsters and stunted-looking “humans”. Poorly laid-out mail-order forms for Star Trek rank badges and memorabilia. Magic: The Gathering spreads with the card text blanked out. Painterly art of monstrous demons. Women in chainmail bikinis. Polyhedral dice! Games that aren’t played on a TV! Board games for adults! Paging through that magazine was like being William in Almost Famous, discovering Led Zeppelin for the first time. It was scary and mind-blowing. And then, of course, there was the ad about the tabletop RPG called Shadowrun. I can’t quite remember when my first exposure to the whole cyberpunk genre was, but this could have been it: 80s-looking punks sticking cables into head-mounted ports, typing on their arm-mounted keyboards while their street samurai buddies covered them with katanas and submachine guns in meatspace. My brain was already reeling from the sheer radness of the idea, but Shadowrun even took it further, sending my developing imagination into China syndrome territory: these were elves with guns! Dwarves that flew jets with their minds! I kind of knew what these metahuman races were (thanks to the Nintendo Power Official Final Fantasy Strategy Guide), but this -- this was just enough to send me into a mouth-frothing frenzy. This was awesome. Awesome. is stuck firmly in the late 1980s and early 1990s. You’ve got elves with a ridiculous amount of piercings smoking cigarettes in the corner of a sweaty rave, trolls with nose rings and leather jackets toting shotguns, deckers (hackers) with mohawks and 80s-cool goggles, and, well, there are dragons pulling the strings behind the scenes of this hazy neon dystopia. It’s the kind of sci-fi/fantasy blend that only a heavy metal album cover could replicate so succinctly: the love child of William Gibson’s Neuromancer, Blade Runner, and Tolkienesque high fantasy, with a smattering of Native American mythology for a unique flavor. And also of course those dragons I mentioned. It’s all such a good fit for a video game and it’s a mystery why a big Shadowrun game hasn’t happened yet until now. Over the course of five main edition releases and countless supplemental setting books that have been released between 1989 and 2013, the Shadowrun setting has grown into a rich alternate universe that possesses limitless potential for thrilling team-based storytelling. Central to the setting is of course the Shadowrun, which the first edition rulebook defines as "n. Any movement, action, or series of such made in carrying out plans which are illegal or quasilegal." Shadowrun, like many other cyberpunk settings, is all about the skilled mercenaries on the fringes of society -- the runners who risk everything and get to experience all the action. It’s an attractive prospect for a pack of gamers looking forward to a night of colorful escapism. It’s also a woefully underrepresented setting in the video game world. Me, I never really got into the role-playing thing beyond a handful of D&D sessions in grade school, a couple of Mage: The Ascension games in high school, and a short-lived Vampire: The Masquerade campaign in college. My early discovery of the Shadowrun universe was without a follow-through until much, much later in the late 90s when I discovered the joys of emulation. I was tooling around with a very early Genesis emulator that was included on a disc of pirated goodies I bought from a seedy shop in Greenhills (and let’s face it -- tech and seedy went hand-in-hand back in 1990s Manila) and I discovered that there was a ROM of the Genesis Shadowrun game on the disc. I was launched back to my Dragon Magazine-fearing youth with its punks and its leather-and-chains vibe and its bad typography and you can bet I played that game for what felt like a hundred hours. I wanted more Shadowrun. I played the SNES game, which was also a totally different experience. I tracked down whatever books I could find, and I read all the cheap Shadowrun novels I came across in sales. But I wasn’t a tabletop player, and it wasn’t enough. That brings us to 2013 and the release of Shadowrun Returns. It’s a totally new game and not a throwback by any definition at all, but the happy feelings that will emanate from you as you play this game might as well be from the 1980s for all the retro goodness that this game will deliver. The RPG gameplay is quite good and the XCOM-ish turn-based combat is excellent, but honestly, the game is generic when detached from the Shadowrun theme. It’s the theme and the story that make it come to life as more than the sum of its parts. It’s Shadowrun, with all the leather-wearing, drek-spouting, virtual reality-hacking 80s goodness that goes with it. I believe a huge part of what makes Shadowrun Returns a Shadowrun game is the fact that one of the setting's original creators, Jordan Weisman, worked on the project. Yeah. Open one of those Shadowrun rulebooks. You’ll see his name right on the credits page. The writing it the game displays such an intimate knowledge of the setting that effectively draws you in with its inescapable combination of convincing dialogue, setting-authentic jargon, and very well-written narration. What’s more, the adventure never has to end again! In the tradition of pen and paper RPGs everywhere, Shadowrun Returns lets players and budding designers create their own scenarios with the very tool that the dev team used to construct the campaign that the game shipped with. Just thinking about it almost makes me believe that there’s still some stories in me waiting to be told -- this time in adventure module format. It really is a good year for Shadowrun. There’s also Shadowrun Online, which is a browser-based tactics game set in the same universe, and a whole bunch of analog products for the setting out this year. If you want to lose yourself in an absorbing old-school RPG setting, pick up Shadowrun Returns. If you want to find out more about the universe, you can now purchase pdfs of the rulebooks. Hey, if you want to play those old Shadowrun console games, there are ways, too! Just do yourself a favor and get acquainted with its world. You may never want to leave. Now... how about a new Crimson Skies game? The thing I wish for me to experience in this lifetime is to be able to reach outer space: to finally get to experience a zero-g environment or even to do a space walk in that dark, but star-filled vacuum. A man can only dream and wish that someone would make space travel viable already! But thankfully, I can look to games to scratch that “space-itch”. And as a young boy, space sims have captured my imagination and enabled me to live out my space cowboy fantasies. My initial foray to the wonderful world of space sims was with one of the most iconic space fighters in the Star Wars universe: the X-Wing. Conveniently, I was accompanying my mom in the mall at that time and I somehow convinced her I needed a new game. After a few nags here and there, she finally agreed and we head on over to my favorite gaming outlet right after we did some errands. I stepped into the store and browsed through a list and the word “X-Wing” caught my attention. After copying the game into a bunch of floppy disks (yes folks I was a young pirate), I thought I was ready to go home. But the clerk told me I needed to photocopy the manual for me to play the game, so I told her to give me a copy of that too, thinking that it was for the lame copy protection also found in other games during that time. Well, it turned out that it really was for the copy protection, and instructions with pages as thick as our school textbooks, on how to fly the ships. I was way over my head with this game, but it was too late to back out then since my mother was handing over the cash to the clerk. When I got home, I promptly installed the game into my computer and went through the manual as the progress bar steadily increased and with occasional prompts for me to change disks to be able to continue the installation. You see, I wasn’t the brightest kid back in the day, so my patience for reading anything that resembles a wall of text and without pictures immediately became boring to me. After the installation, I ran the game and tossed the manual aside after the obligatory copy-protection question. The game told me I was going into my tour of duty for the Rebellion and I needed to fly missions. Again not paying attention, I clicked my way through until I got into the cockpit of the spaceship. Once inside the ship, I was overwhelmed but also fascinated with all those lights, screens and sensors around the ship. Then it was time to move to a waypoint. “Uh-oh” I said. I had no clue on what to do or press. I picked up the tossed-away manual gently and tried to absorb everything written on it, looking for that overview of keys and functions of the ship so I can at least get it to move. Once I found the right keys, I jabbed a finger in the keyboard and suddenly my X-Wing fighter had those iconic light streaks all around. I was going into lightspeed and heading to the waypoint. At last some progress! Then the game alerted me that enemy TIE fighters were coming in and I was free to engage them. Engage them? You mean fight them? Oh jeez! What do I do now? Again referencing the manual, it told me I can cycle through targets, fire some lasers and even shoot proton torpedoes. So I memorized the keys and now I was dog-fighting with those pesky TIE fighters, just like in the movie! After a few sorties with the Empire, my ship finally succumbed to damage and I was forced to eject from the X-Wing and try the mission again. I read through the manual some more and tried to learn about power management for this ship and then realized that I could either distribute my power to the engines, shields or the laser cannons. This really opened up the game for me and got me to think more strategically on how to fly better. I flew more missions and really got into the game to the point that I memorized and knew the characteristic of all the ships found in the game. This actually led me to wanting to watch Star Wars again and again so I can see all those ships come to life. After going through X-Wing, I picked up and enjoyed more space-sim titles like Wing Commander (1-4), Tie Fighter and of course X-Wing vs TIE fighter. I enjoyed getting into cockpits of different ships, figuring out their intricacies and knowing how to exploit their advantages during a dogfight. And of course, I also enjoyed the “scenery” of space, seeing the stars and nebulas as you jump from one waypoint to the other. Oh and don’t get me started on the ship designs, especially capital ships! It was exhilarating to fly by big hunks of metal, steadily coasting through space. Having to fly with a fleet and then suddenly break out into an epic battle always has that special place in my heart. Sadly, after the mid 90s, I’ve never had the chance to experience a proper space sim unlike the glory days. Luckily, Kerbal Space Program tries to scratch that itch of exploration and bewilderment with outer space. And of course, you can’t talk about space sims without Star Citizen, which sadly we all need to wait for until 2014, when we’ll finally be able to experience the masterpiece of Chris Roberts. I look forward to next year, and be that kid again who loved to go to outer space and just fly his damn spaceship! It’s a pretty well-known fact in the community that I am a big sucker for co-op games. I’ve written about how it is my preferred game mode and participated in numerous co-op commendation posts. And whenever some of the OMGeeks talk about a game in the Steam Chat Room, the first question I always ask is if the game has a co-op mode in it and if the answer is “yes”, I’m guaranteed to be interested. I would like to attribute my love of co-op games with one of my most vivid memories of playing an iconic game called Contra. For some reason, my father picked this game out for me so I had more games to play with the newly bought Famicom. His justification for buying the game was simple: the cartridge art had a lookalike of both Sly Stallone and Arnold Schwarzenegger, both action heroes of the 80’s, so it must be good! My young mind also bought into this reasoning and I excitedly inserted the cartridge and waited for the screen to come alive with the game menu. But instead of a simple game menu, I was greeted with the most badass 8-bit theme that my young ears ever heard. I was so pumped to play it and was about to mash start with my tiny thumb, but then I noticed that there was a 2-player option. And I screamed at my dad that we should play while pointing at the screen. Initially, I assumed the game mode would make us go one by one and take turns every time our electronic avatars would die. But I was pleasantly surprised that I saw both of our characters on the screen together and instinctively yelled with glee “Wow! Pwede pala 2 players sabay!” (Wow! We can play 2 players together!). And from then on, I would address co-op games as “2 players sabay” kind of games. As everybody knows, Contra is ruthless! And having my dad being the guy in red pants didn’t make it any easier. We tried our hardest to dodge bullets, while firing back at the enemy and at those chrome-finish turrets. I would excitedly yell at my dad to shoot the blimp thingys and get the power up. We would also try to coordinate and execute some sort strategy with either one us staying at the top most part of the level and the other staying in the water. This would ensure that each of us was covering a portion of the level. But me and my poor dad, with just 2 medals each (which represented our lives in-game), it was just too much for us. That evil metallic wall of death with guns mounted on it and enemies pouring out was too difficult to kill. Sadly, my dad was running late for the office and he had to put down the controller and told me that we will pick it up again in the evening. I felt really frustrated that we couldn't finish the level, but on the other hand, was feeling very elated with the brief, but eventful experience. Seeing me and my dad working together in one screen and shooting down enemies was a really new and exciting concept for me and I wanted more of it. Since my dad was a very busy businessman, we never did pick up the game again. My cousins had the pleasure of finishing Contra with me. Nevertheless, I will always and forever cherish that initial moment, when me and my dad were side-by-side, comrades-at-arms, shooting electronic bad guys and covering each other like in those action movies that he would surprisingly allow me to watch back then. To this day, when playing co-op games with Jed and Mike or even with the folks in the community, I still get that wonderful, tingling feeling while playing and yelling victoriously or sighing collectively, depending on the outcome of the game. Regardless, playing cooperatively with friends or family is still, and always will be, the best feeling in the world.